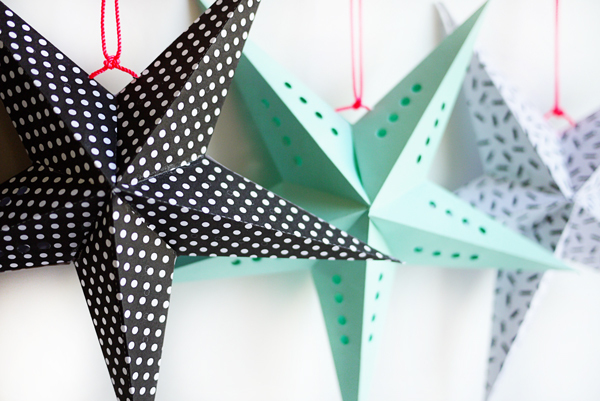 I recently returned from a trip to India where beautiful paper stars (leftover from Christmas) were hanging everywhere! Even though the holidays are over, I loved how fun & versatile they were. 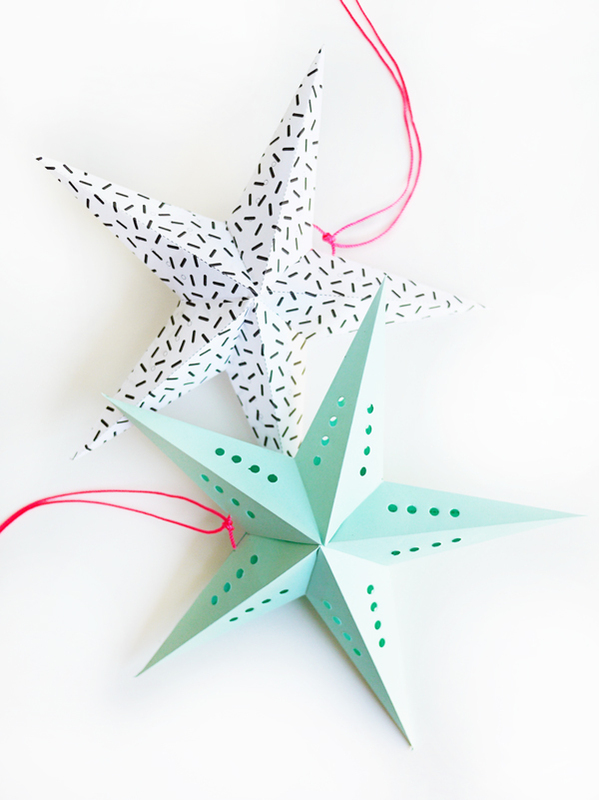 These printable stars can be printed on any color paper which makes them the perfect addition to any party you were planning. Hang them from a centerpiece or string them together to make a banner. Fold one into an envelope and sent as a birthday card to let a special someone know that they are a super star! 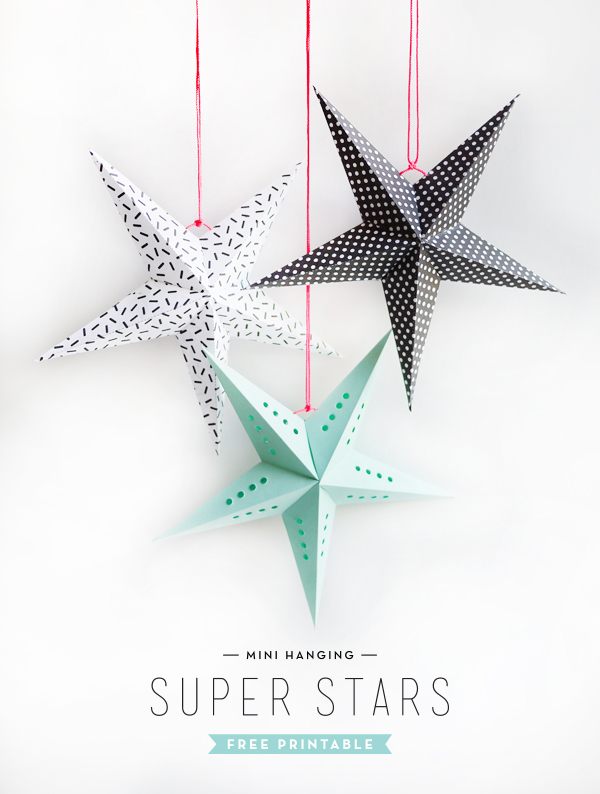 Step 1: Print out the Printable Mini Super Stars on 8.5 x 11 text weight paper. 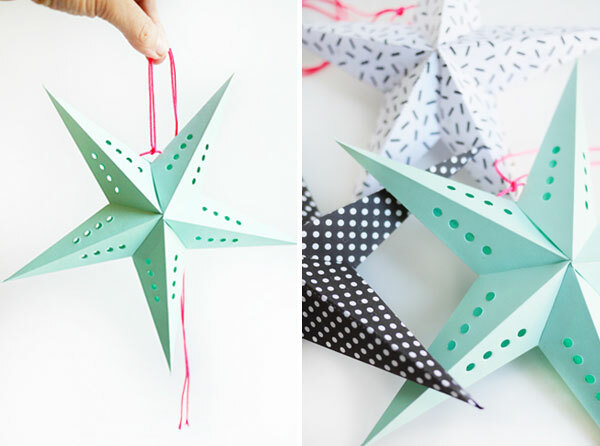 For the solid color stars you will print out pages 5 & 6 of the PDF. Step 2: With scissors (or craft knife) cut out all 5 pieces of the star. Step 3: Cut a small incision of the bottom of the star piece to separate the bottom flaps (see picture). Step 4: Fold along all of the dotted lines on the star piece using the bone folder. Step 5: Keep the left side of the star piece folded. Using the screw punch (on the largest setting if you have options) make holes following the printed circles. Repeat on the right side. There will be 4 sets of holes using this double-up technique. Please note, punching holes in the patterned stars is not necessary. Step 6: Unfold the star side and refold the other way so that all of the dotted lines are on the inside. (This is not necessary for the 2 patterned stars on pages 1-4 of the PDF). Step 7: Place glue on the small flap of the star piece & and glue the piece together (see picture). Let dry. Repeat Steps 3-6 for the remaining 4 star pieces. Step 8: Take one star piece and put glue on the outside of the bottom flaps. Line two pieces up so that the flaps are facing the same direction. Fold the glued flaps down into the second piece (see picture). This part can be a little tricky but if you’ve been careful with the folding then all of the star pieces should fit together easily. Repeat with the remaining star pieces so that all of them are attached. Step 9: One star piece will have extra bottom flaps. Glue those inside that piece (see picture). Let star dry. Step 10: Using the 1/16” circle hand punch, make a small hole on the crease of the two outside star pieces. Make sure to punch in the same spot on each side. Depending on the string you use, you may have to punch a couple holes so that the string fits through. Step 11: Pull string through the holes at each side so that when the ends are tied the star will unfold and take shape! 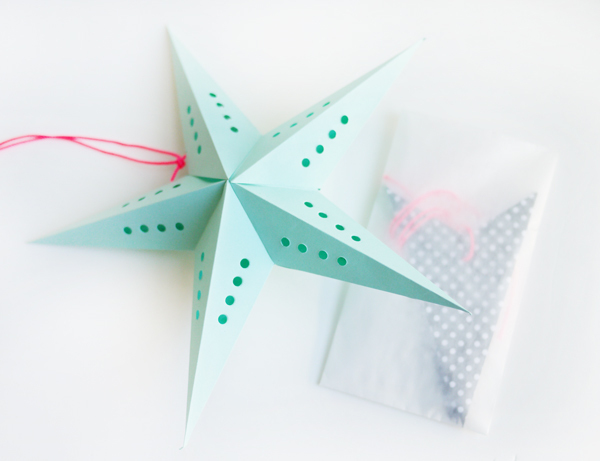 Step 12: If you’re not ready to decorate just yet, fold the star down and store in an envelope… or send off to a friend! These are so cute! They would look amazing for a bedroom. I love these! Are they hard to make? How long do they take? These are too cool not to pin! I’m a new follower through Bloglovin, your blog is amazing! It’s very nice to meet you. Dear alix,i cant download te printables of stars…just click on the highligted words right..
Well, how darling are these little stars! I can’t wait to give them a try! @Sierra – I made one at my desk at work (shhh!) in about an hour. It took a little time to figure out what folded in what direction, plus I paused a couple of times for email or the phone! Mini Stars are so cute! I love it! I can’t get over how cute these are! Such a bonus that they are mini! This stars looks super cute I love them! How cute. These would go perfect with my v-day table set up idea.